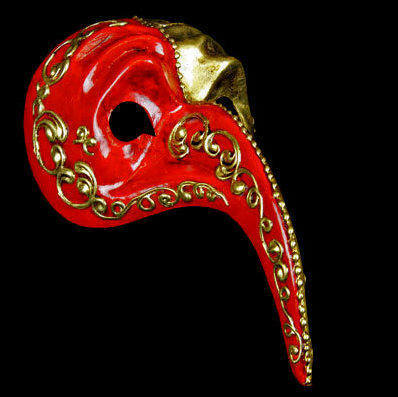 Red & gold painted traditional venetian full face mask & is excellent for a man to wear for masked balls. Create a look of pure elegance and luxury with this traditional Naso Turco Mask - Red & Gold by Simply Masquerade. Designed to evoke a mixture of refinement & a sense of history, this stunning full face mask is handcrafted in papier-mache & beautifully painted in colours of antiqued gold leaf and bright rosso red, segmented and bordered by aged glimmering gold. The masquerade mask is secured by satin ties for a secure fitment & inspired by traditions of old Venice, this exquisite design will breathe tradition and purity into all of your party looks this year.